With two active, young daughters in our home; the holiday season becomes a blur from Halloween through New Years Day! We race from school events to extra curricular activities to social gatherings for weeks! Over the years, my family became the hosts for annual holiday gatherings and still frequently host an annual Christmas dinner. This year, we had the opportunity to simplify some of our holiday hosting duties with a review of HoneyBaked Ham's seasonal side dishes and their specialty ham and turkey meal offerings. What did we think of our #HoneyBakedHoliday dinner? We wanted to share our #HoneyBakedHoliday dinner experience with you! You can also learn how to enter to win a $25,000 Kitchen Makeover at the end of this post! Note: We received a gift card from HoneyBaked Ham for use in purchasing items for this post. All opinions and experiences are our own. Holiday Meal Ordering from The HoneyBaked Ham Store. We order from the Honeybaked Ham store on McNaughten Road in Columbus, Ohio. There have been a few shops pop up in local supermarkets--but, we have always had fairly positive experiences with our usual HoneyBaked Ham store. The ordering process varies a bit from store to store. I was unable to place a direct order for my entire meal. 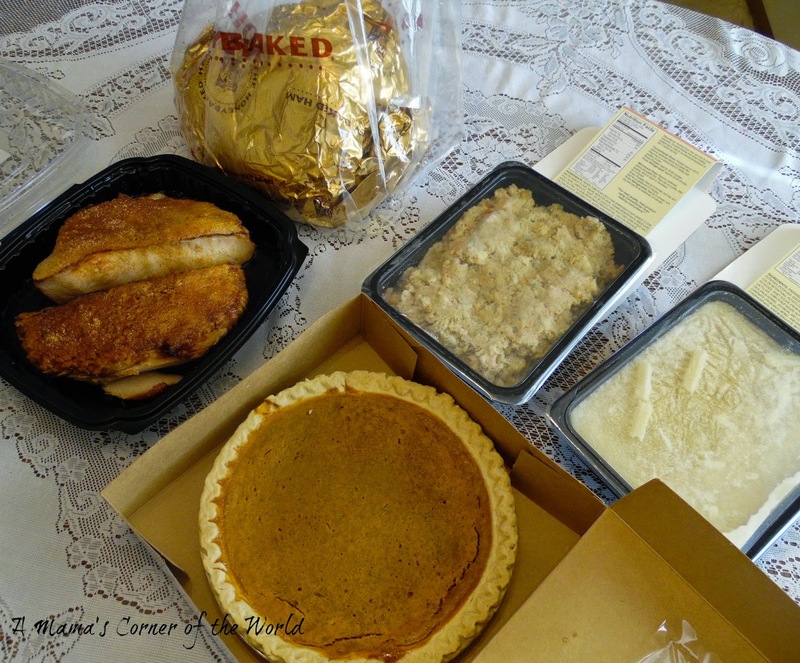 Instead, I placed reservations for my ham and turkey--and simply ordered my other desired side dishes when I arrived at the store. Normally, for an important meal, I get a little crazy--and triple check everything. 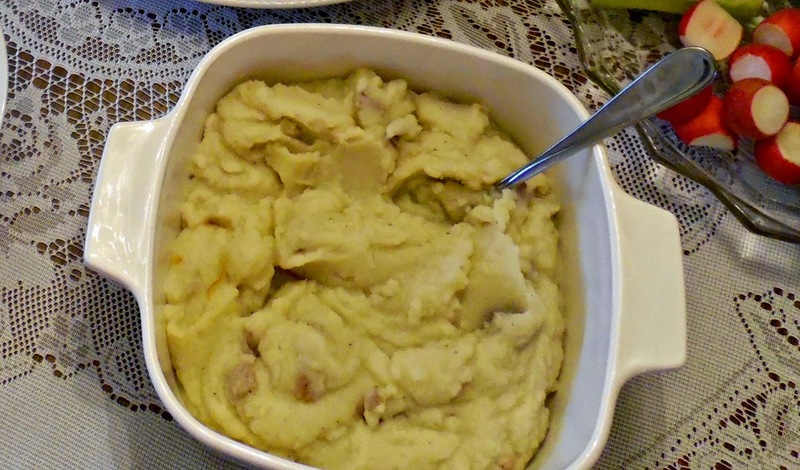 Since it is recommended that the meats not be picked up more than a day or two before serving--I was afraid that I would have to make multiple trips to the store to get my desired side dishes at the last minute. The store representative is always so reassuring--and, so far, our orders have been completed in one stop. We ordered a Whole Roasted, Sliced and Glazed Turkey Breast, a Half Ham in the 8-10 pound range, a side of Herb Stuffing, a Side of Garlic Mashed Potatoes, a Pumpkin Pie and Turkey Gravy to supplement a few of my own side dishes. The store that we visit offers Turkey Gravy--but, it was not available when we visited--so I had to make my own this time. Our Christmas dinners always star the ham! 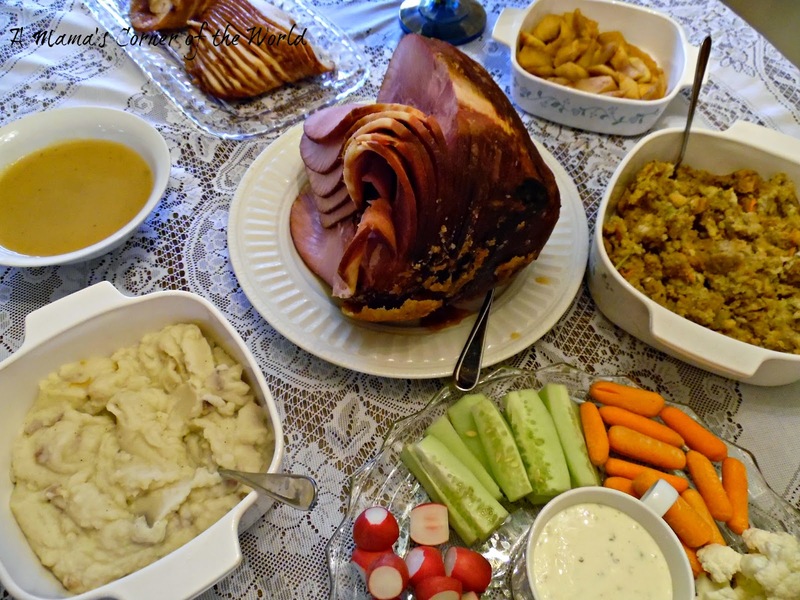 This year, the ham was joined with turkey, mashed potatoes, stuffing, vegetable and fruit trays, cinnamon apples, dinner rolls, gravy and a host of holiday desserts. We pick up the HoneyBaked Ham items cold or frozen. 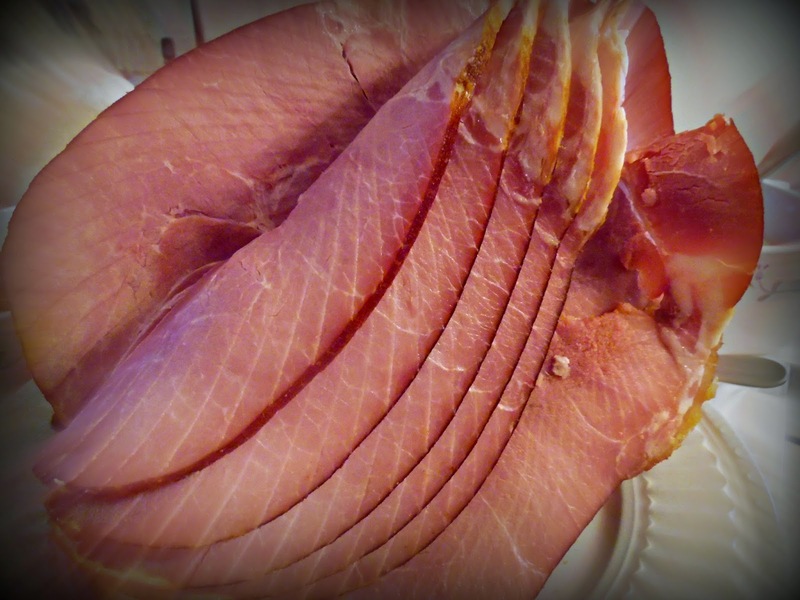 HoneyBaked Ham Products heat and serve quickly and easily. In less than an hour, the frozen Mashed Potatoes and Stuffing went from their plastic, heat and serve containers to my serving dishes. Both the ham and the turkey are fully cooked, glazed, sliced and ready to serve--at room temperature. You should not pop them into the oven like you normally would! I struggle with serving cold/room temperature, main dish meats--especially for a more formal, holiday meal, so I sought out some heating and care instructions on the HoneyBaked Ham website. I was able to successfully heat the ham and the turkey with the instructions--but, both are really very good served at room temperature as well. It's easy to see why the ham is the star in this photo! Of course, the turkey breast is wonderful too! No baking. No thawing. 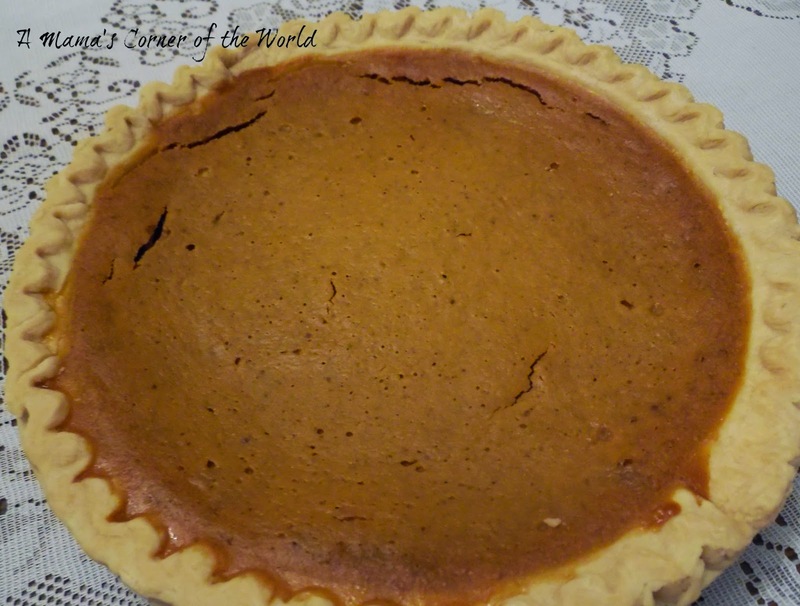 Simply remove the pies from the boxes and they are ready to serve! 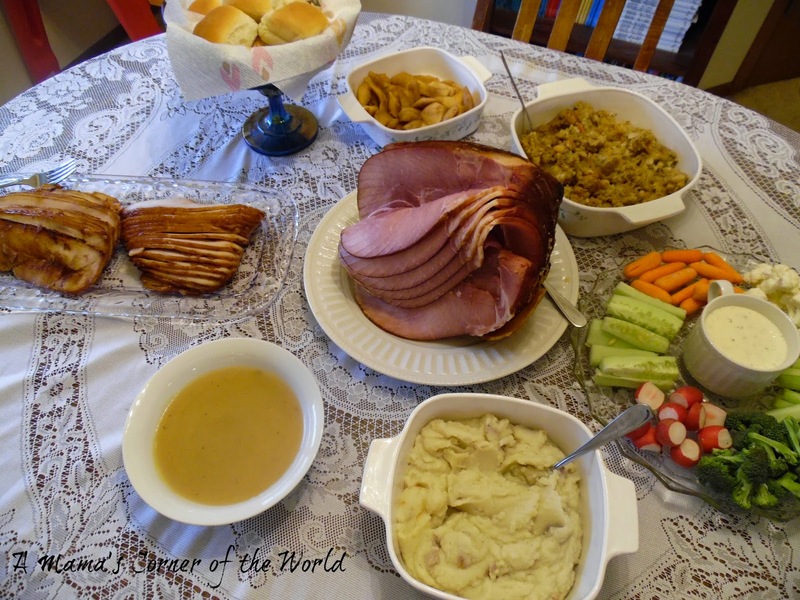 After warming, I simply placed the HoneyBaked Ham dishes into my own serving bowls and platters--and dinner was served! As always, the herb stuffing, turkey and mashed potatoes were hits with the crowd--but, the ham is truly a show-stopper. You can still see bits of the glaze on the ham from this angle. 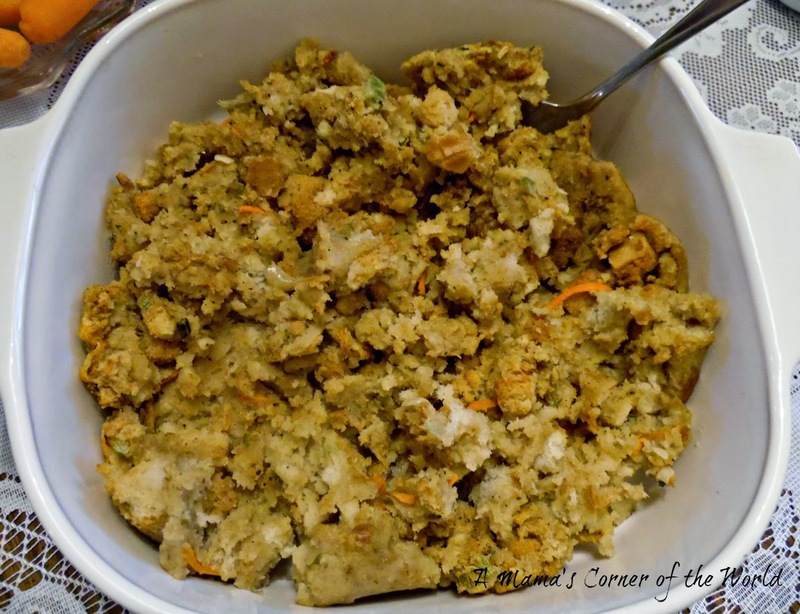 Would I recommend making your holiday season easier with a #HoneyBakedHoliday meal? We have hosted numerous parties, gatherings and meals featuring HoneyBaked Ham products over the years--with resounding success. Our guests are never disappointed and we are rarely left with leftovers. The holiday season leaves many of us too busy, too stressed and with too many responsibilities to enjoy our family and friends! 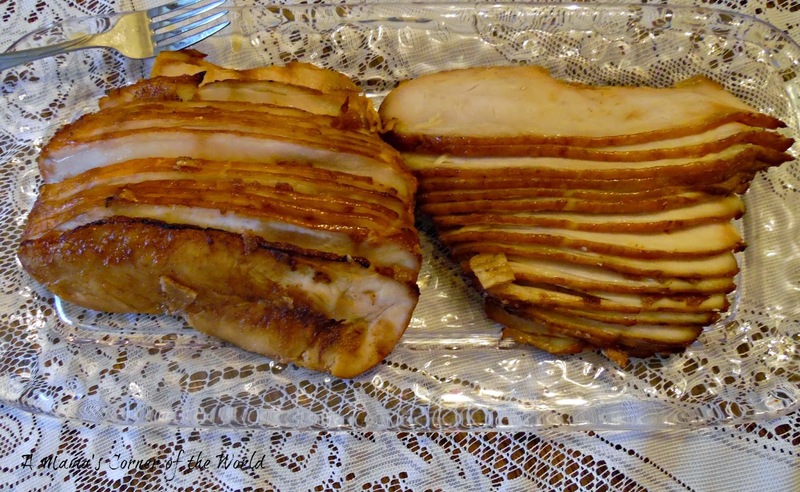 I would certainly suggest simplifying some of your dinner hosting duties with HoneyBaked Ham. From now until 1/11/15 you can enter to win a $25,000 HoneyBaked Kitchen Makeover when you buy a Ham and Turkey Breast bundle from HoneyBaked Ham. 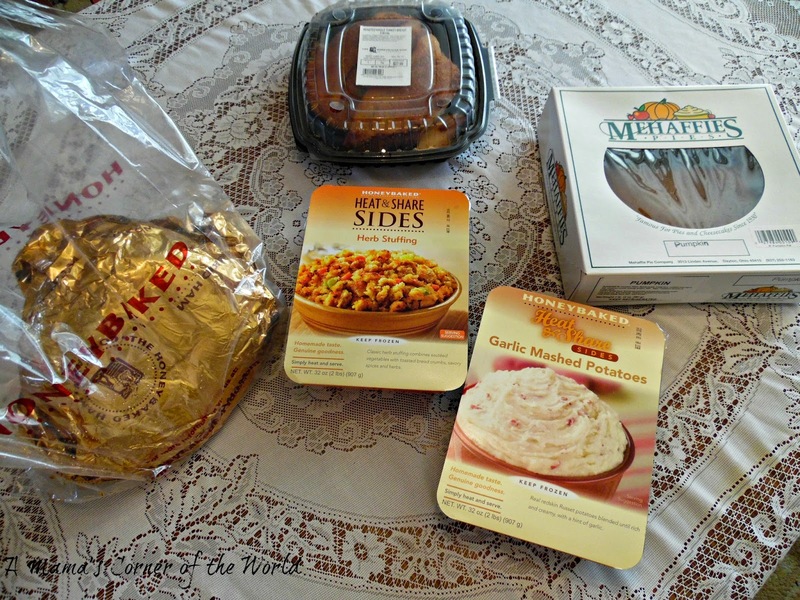 Note: We received a gift card from HoneyBaked Ham for use in purchasing items for this review. All opinions and experiences are our own.